Forfar keeper Darren Hill saves from Leighton McIntosh. After 19 games without defeat, Peterhead suffered their second consecutive defeat following up the one to the then basement side Cowdenbeath with another to strugglers Forfar. With Rory McAllister one of those to be rested, inevitably the attack lacked some menace. Leighton McIntosh was the main threat with his pace but Shane Sutherland had a quiet game until being substituted and a goal rarely looked like coming. The visitors went through the motions without any real conviction. Athletic started well with Andy Ryan the main focus of their attacking intent. He headed over following a corner kick early on then set up Omar Kader who shot into the sidenetting just before half time. Youngster Scott Ferries failed to grab his chance and impress and teenager Marc Lawrence likewise looked short of match fitness and certainly not ready to challenge for a starting berth based on this 90 minutes. 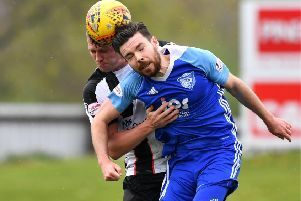 The chance of an improvement from the Blue Toon after the break was dealt a blow as Forfar went in front just three minutes after the re-start. A Steven Craig effort was well saved by Graeme Smith but his fellow defenders were woefully slow to respond unlike Danny Denholm who pounced to score from six yards to give his side a deserved lead. Peterhead should have equalised with a well-struck free kick from Jamie Stevenson 25 yards out that looked like it was arrowing into the very top of the left corner of the goal until keeper Darren Hill appeared from nowhere to get a palm to the ball and touch it wide. That was a game changer as the Loons went up the other end and scored again with 54 minutes gone, Kader squaring the ball for Craig to sidefoot a decisive second. McAllister and Andy Rodgers came on just after the hour mark in an attempt to salvage something from the match. But although they injected a bit of freshness and endeavour, the Final and Rangers were clearly more in the mind than scrapping for even a point.